Prince William is facing a right royal wedding dilemma. The Duke of Cambridge is the President of the Football Association and would be expected to present the trophy to the winners of the FA Cup Final on May 18. But I can reveal that this year's royal wedding is to be held on the same day. Lady Gabriella Windsor, whose father Prince Michael of Kent is a beloved first cousin of the Queen, has chosen May 18 as the day she will marry businessman Thomas Kingston at St George's Chapel, Windsor. The Queen is among those expected to attend the wedding. 'Poor William, it will give him another headache,' a courtier tells me. 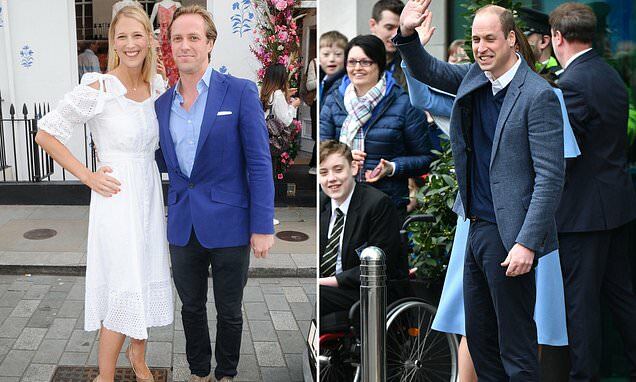 Ella Windsor attended William's wedding in 2011 and he would want to return the compliment. Wills faced the same dilemma last year when Prince Harry and Meghan Markle chose Cup Final day for their wedding. Keen football fan Wills had to skip the match between Chelsea and Manchester United, leaving Jackie, the widow of England star Ray Wilkins, to present the trophy. When Meghan Markle was pictured kissing Prince Harry before she presented him with the winners' trophy at the Audi Polo Challenge, it confirmed the event's central place in the royal social and sporting calendar. However, I can disclose that this year's charity tournament is not expected to go ahead amid claims that Audi was asked to increase massively its donation to good causes supported by the Prince. Last year, both Harry and Prince William played in the competition, held at Coworth Park in Ascot, where spectators included Oscar-winner Eddie Redmayne and Wimbledon champion Serena Williams. 'There has been real shock, because Audi has provided 16 years of loyal service holding the event with the Royal Family,' an insider tells me.